This is green ear caused by the metal from Barbie's earring that were left in her ears. Because Barbie dolls have been one of the most popular toys for girls since 1959, most that you acquire will be in played with condition. Being well loved by little girls you will find Barbie with hair trims, worn off makeup, neck splits and (ugh) the dreaded green ear. Early Barbie dolls had ponytails with a hard curl at the end. Creative little girls sometimes wanted to change Barbie's hairstyle. As the child tried to comb out the end of the ponytail, she found that she had made a total mess of Barbie's beautiful ponytail (sob). Here she had a a mess with hardened glue and no way to get it back the way it was. Then the child would get a brilliant idea which involved scissors! Time to restyle Barbie's hair (snip!) 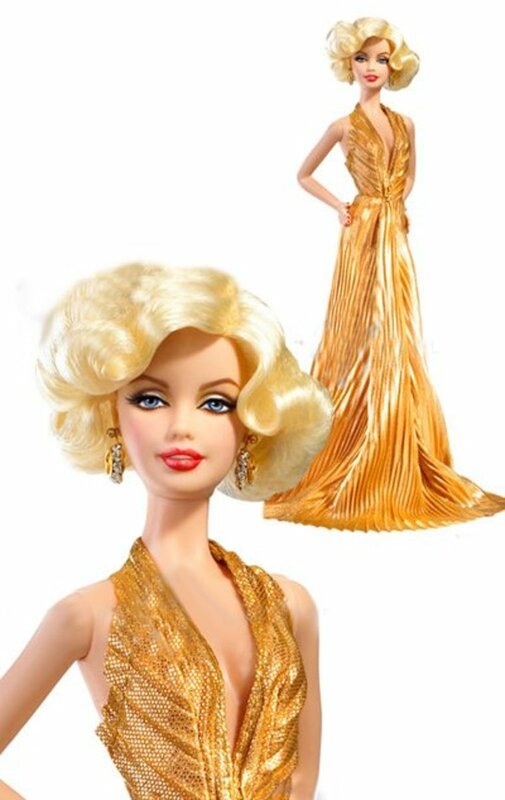 Barbie now had shorter hair and many times her hair would end up in a bun or just shorter. 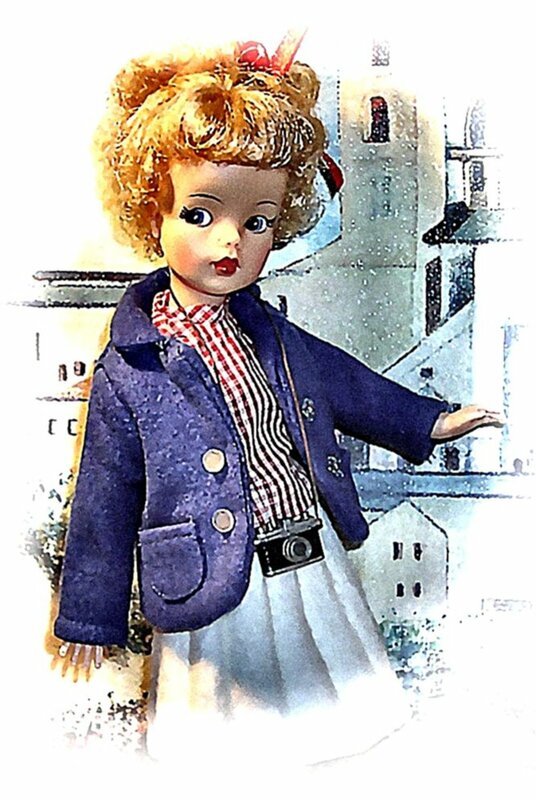 When the new "bubblecut" Barbie came out in 1962, there were less hair cuts unless the owner of the ponytail Barbie tried to make her ponytail into a bubblecut. Obviously Barbie can not regrow her hair , but there are many talented people that can successfully re-root her to the original hair style. Before you choose a re-rooter, ask for references. Worn off eyelash ridges are common for the early Barbie dolls and can be touched up with black acrylic. 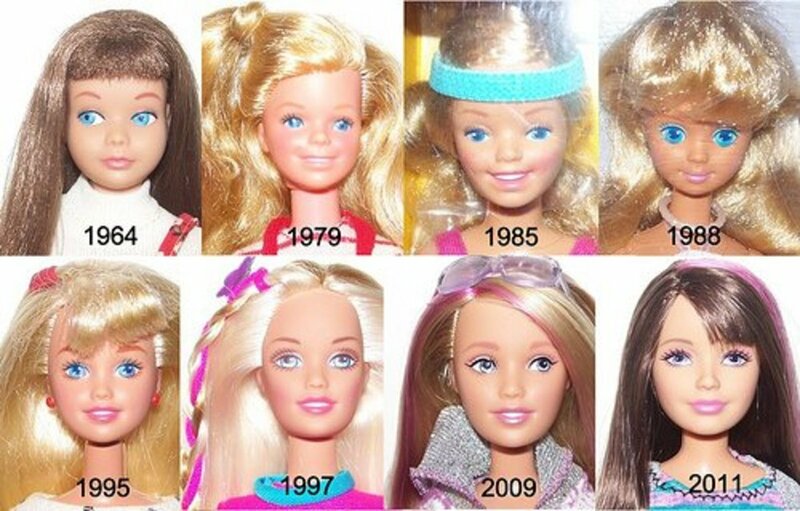 I have done it several times which greatly improves Barbie's look. Lips and eyebrows are another thing. it takes a steady hand and a person with artistic talent. Never , never use oil paint or fingernail polish which will totally destroy your doll. Only use acrylic which can be removed if you make a mistake. I would encourage you to find a professional as I recommend for hair re-rooting. There are those that do both types of Barbie restoration. I have an artist friend that makes a stencil to use for painting eyebrows so that they match perfect. Neck splits can be fixed by using super glue as it is slightly flexible. If head feels cold warm it up slightly with your hand or hair dryer because the cold vinyl can split more. Be very careful though as a hair dryer can melt the hair. You need to protect the hair. Remove head carefully. Apply super glue with a toothpick to each side of the split , hold together until set. Very carefully after the split it is dry and well set very carefully rotate it in a rolling motion on to the body. In other words don't just shove it onto the body or it could re split. Green ear was caused by a metal reaction to the vinyl from the doll's earrings. Remove earrings if still in the ear.. If the green is extended over a large area it becomes a nightmare to fix. But if it is just around the ear you can fade it or make it disappear. There are a few treatments you can try but never mix them as you will get a chemical reaction and the green area make turn an ugly brown or even black, Above all be patient. the treatment may take a month or more. Some of the treatments are Tarnex, CLR or Remove-Zit a product by Twin Pines. (twinpines.com) I have never used the Twin Pines, but it is sold on their websites and they will give you the instructions. I have used CLR and I have used Tarnex.The directions for Tarnex or CLR are the same. Choose one. Do not mix. You will need to Remove Barbie's head carefully. With a Q-Tip and a little Tranex or CLR clean out around the ears inside the head. Some green will more than likely be on the Q-Tip. Also clean off the outside being careful not to get it on the dolls lip or eye makeup. Break off the end of a toothpick (pointed type). Tear off a tiny bit of cotton from a Q-Tip or a piece of cotton . twist it onto the sharp point of the toothpick. Dip it into the treatment. Place it in the Barbie's earring hole and place the head where it will be safe. Each day redo this routine and eventually you will see the green ear fade. You may have problems keeping a toothpick and cotton in both ears so you may end up doing one ear at a time. 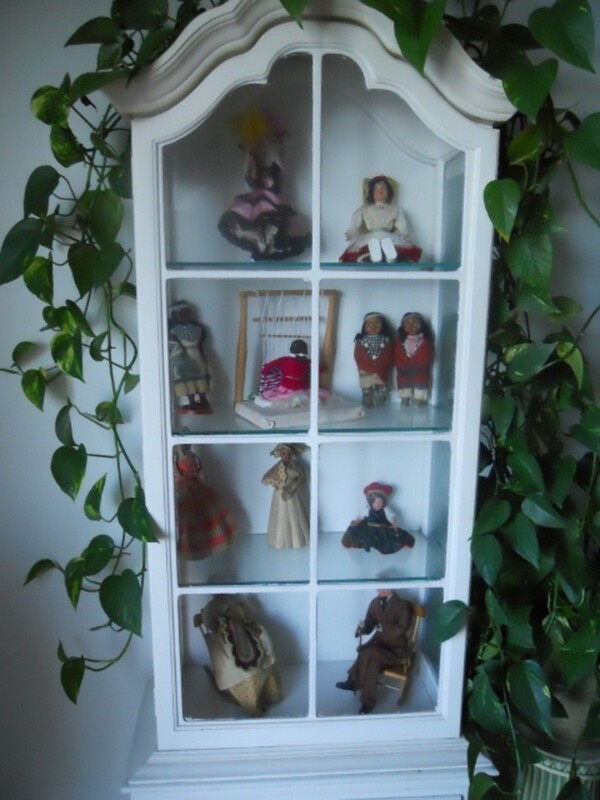 It can be very rewarding to restore a vintage Barbie doll! The only Barbies I would be concerned about are the Silkstones as they have had problems with ears reacting to the metal. I collect barbies I don't have any of the old ones most I have are from the 80s 90s and 2000s are the earings safe in them I just got for my birthday a 2001 collector barbie in mint green dress with glitter all over her dress I looked at the earings in her and I don't know if I should take them out I really don't want to open the box what can I do I don't see any green ear I have looked at all my barbies and none of them have green ear at this stage. 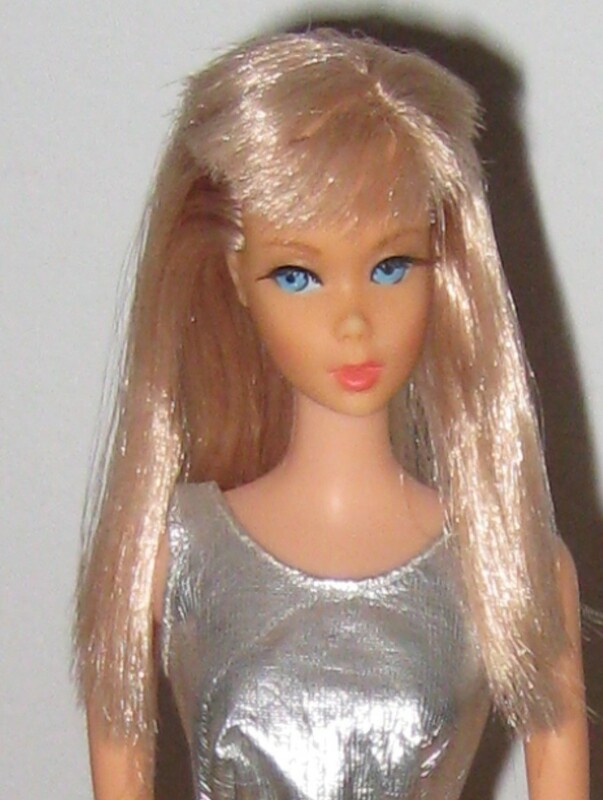 I also have a peaches and cream barbie should I take the earings out if her she is the 80s barbie. I look forward to getting help on this matter. When I had my Patty Play Pal restored I was told to use Ajax with Bleach to get off some pen markings on the side of her face, and I tried it and it worked, but be careful when using it for green ear. How do you replace missing Barbie fingers? Latest releases barbies is That problem solved?? Linda you can recolour the lips by either using a q-tip and nailpolish remover or just paint on top of the original (easier because you still keep the outline ) use acrylic paint ONLY and to make it last get an acrylic varnish/cover/stuff. Anne you can do rerooting yourself it's not that hard and it's probably cheaper but you would want to practice multiple times before working on a vintage doll just to make sure you don't ruin her hair. hello.i would like to know where to go to have someone reroot my daughter's barbie's hair.she wants it a different color and length. thanks! I agreee, DO NOT USE TARNEX, it does NOT at all help with green ears and it severly damages the vinyl (leaves brown stains). 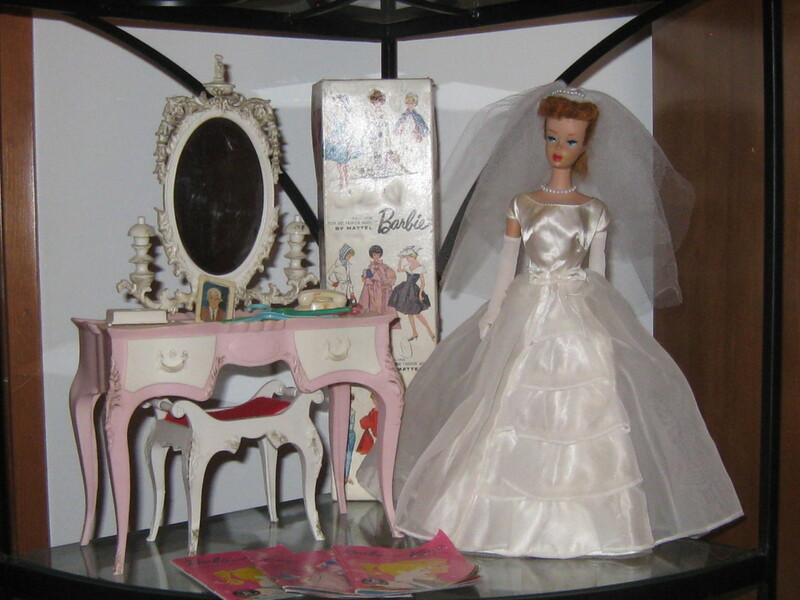 I wish I still had my vintage barbies! 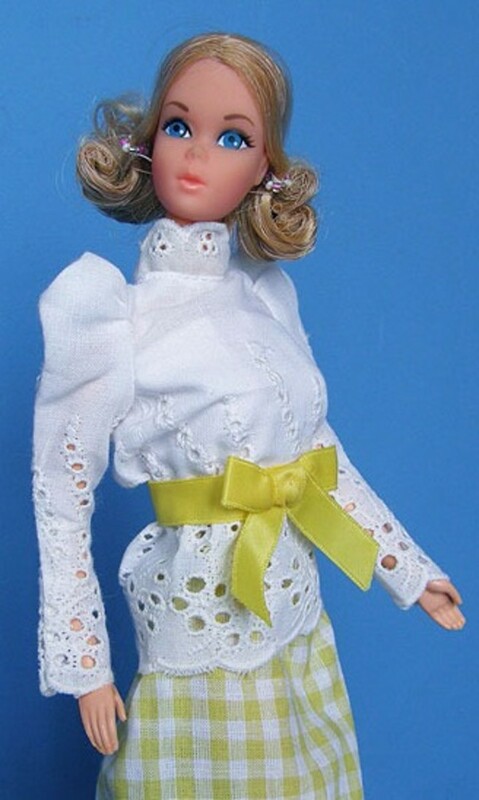 How can I replace.repair a missing pinky finger on a vintage #4 barbie doll?